Well Nikki and I did it! 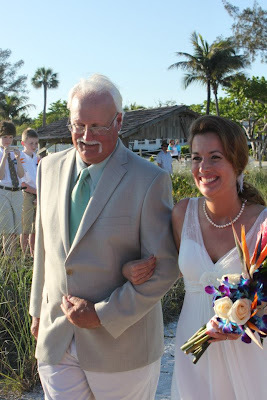 We got married at Sanibel Island, and it was a totally perfect wedding ceremony and reception. Could not have asked for a better wedding! I know it is a fishing blog; so I will spare you all the non-fishing aspects of our trip, and I will get to the fishing side of what we experienced. I fished right off the bat in the backyard pond at my parents house the first morning before we left for Sanibel Island. The afternoon we arrived was really nasty, and as we landed there was a torrential down pour. Luckily it ended at my parents house outside of Tampa, and we had heard the prediction was to stop raining at Sanibel too. The bass fishing was rather good for the quick session I had in the backyard. This "Kicker Frog" I tied was about 2 inched long - What a bucket mouth! When we arrived at Sanibel the weather was breaking up, and it was lucky; since our pre-wedding party was about to start, and the wedding was the next day on the beach. Seemed like things were promising. Our party worked out very well, and the food, drink, and company were all wonderful. The next day, all I had to do was wait for the wedding; so Lance (my Father in Law), Randy, and I headed to fish the Blind Pass between Sanibel and Captiva Islands. Fishing was kind of tough because the water was stirred up from the recent weather, and the clarity was lacking. I did manage to get into a few fish, and had a nice snook come all the way to my feet before it swam back off to the mysterious holding water it came from. Spanish Mackeral were running, and even the dinks were scrappy. 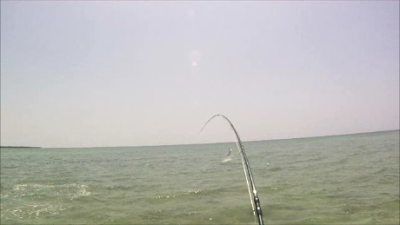 Blind pass is always good for a few Ladyfish; which is a fun fish to catch while targeting other fish like Snook. They are quite scrappy for how small and skinny they are, and the nice sized ones will really surprise you at times. Little Ladyfish like this can actually be entertaining on really slow fishing days. Overall, I have experienced much better fishing at Blind Pass on a previous visit there, but it is always nice standing around in warm water; no matter how slow the fishing is. Plus I was rather excited being that I was going to be married in a few hours. The wedding was totally amazing, and I can say it was the best moment of my life seeing Nikki walking down the aisle (beach) towards me about to become my wife. Best catch in the whole world for me!! After the wedding, we hung out at Sanibel for another day, and it was just a relaxing beach type of a day. We did find all sorts of interesting things on the beach, and one was this little monster. This little catfish could really do some damage for anyone wanting to impale themselves onto its pectoral fin. Its fin would grip extremely even just rubbing it along my finger. I thought of what a predator may feel trying to eat this fish. One of the best parts of Sanibel Island is how the beaches are loaded with the most magical shells you could possibly fathom. The magical beaches were one of the reasons Nikki and I liked it so much there, and the place had a strong influence on where we wanted to get married. The Best Pizza is at Rocco's! We then woke up early Monday morning to drive to the keys. We got there about 8am, and our first stop was at the famous Robbie's to feed the tarpon. It was as awesome as I always pictured it to be, but even cooler to see all of these huge fish waiting for you to feed them. Under them is a layer of huge jacks waiting to get the scraps that escape the tarpon. We then checked into the awesome place we scored to stay at for the week, and it was better than we anticipated it to be. The owner of the house was super nice and accommodating, and he told us where to find all of the good eats and drinks in Islamorada. View of the house from the dock.....what a pad! Wish we could live here! We basically relaxed, fished, ate the freshest seafood, had good drinks, checked out Key West, went on a couple of guided trips, kayaked, and had toooooooooo much fun. I can write about our trip for days; so I will spare all of you from that. I can tell you that the Florida Keys are a totally amazing place to check out. The fishing is off the charts, and the scenery is dazzling. It is the only place I have been where you cannot tell the horizon from the water half of the time when the winds are calm. It is a like a desert oceanic oasis, but it is tropical. A super laid back attitude exists there, and I felt the similar attitude when I have had my visits to Hawaii. We will be back to the Florida Keys!!! Below are some pictures from our fun times at Islamorada. Too many to put up; so I just put a bunch up to show you all the general idea of what we got to experience. When they said Key West had old historic housing; they were not joking around. Our next door neighbor guide Captain Will McCabe - Awesome tarpon guide!!! This little jack made the 9' 8wt fold over harder than most steelhead would ever do. Stripping flies into slightly deeper potholes on the shallow flats was really producing. Lazy Days was one of our favorite places to get food and drinks.